Iceland had become a hotspot for travel with tourists flooding Instagram with the stunning waterfalls, black sand beaches, and rough volcanic terrain that Iceland has to offer. This will be the first of two posts focused on traveling to Iceland. In September I was lucky enough to experience this breathtaking scenery first hand and wanted to share that journey and advice on what to wear to Iceland in September with my readers. Prior to booking a trip to Iceland I did a lot of research on the best travel companies to book through, the best sights to see, currency exchange rates, the cuisine there, power converters, and what to wear to Iceland in September. My goal is that this posts acts as a checklist for you to know everything you’ll need before embarking on your trip to Iceland. Before booking anything be sure to review the visa requirements to visit Iceland based on your citizenship. U.S. citizens may enter Iceland without a visa for up to 90 days for tourist or business purposes. Your passport should be valid for at least three months beyond your intended date of departure from Iceland. Visit the US Embassy website (here) to be sure travel restrictions haven’t changed since this article was posted. What Gear Do I Need for Iceland? 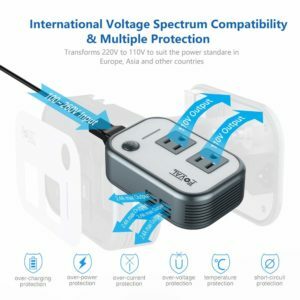 If you are visiting from the US, the chargers for your various devices are likely not compatible with either the outlet nor the increased wattage in Iceland. If you do not get a stepdown converter you risk the chance of forcing more power through your devices than they can handle resulting in blowing up your much needed phone, computer, or other electronic device. Don’t do this. Save yourself a lot of money by avoiding frying your devices via power surge and go with a good adapter with a 220v to 110v stepdown ability. Read reviews, do you research, and don’t skimp out on this, your devices depend on it. After much skimming through reviews I went with the Foval Power Step Down 220V to 110V Voltage Converter with 4-Port USB. It came with three adapters, had two outlets, and had the four USB slots. I’ll admit at first plugging it into the wall in Iceland I was worried due to seeing reviews & photos of other adapters blowing up, however my fears were unfounded as it worked perfectly! The only thing I noticed is that if I was charging two phones and tried running a tablet off the USB as well it started to get hot therefore I limited my devices to only charge two at a time. One final piece of advice is do not try to run a hair dryer or coffee pot off these, they require a lot of power and could short out the device. Iceland is beautiful however one thing that all tourists need to be aware of when determining what to wear to Iceland in September is the volatile weather. You can go from sunny and 55°F in the morning to 30°F and snow an hour later. One thing that is usually consistent is banking on the high chance that it’ll rain at some point during your trip. Having quality rain gear is extremely important if you want to enjoy your trip, we used ours numerous times both during a rain storm but also so that we could walk behind the Seljalandsfoss without getting soaked. Since we wanted to travel light our tactic was to bring as much packable clothing as possible meaning we opted to leave behind heavy jackets in exchange for goose down puffer jackets (following section) and lightweight high quality raingear as an over coat for protection. Since many of the tours were entire day trips I had to pack multiple gear into my bag (food, clothes, chargers, camera, etc.) and some of the landmarks required a bit of hiking I didn’t want to get caught in the rain with all my stuff and have it soak through my backpack ruining everything. I really wasn’t interested in spending a ton of money on a backpack since I already have a good frame pack for my other expeditions that I was leaving back home due to size. 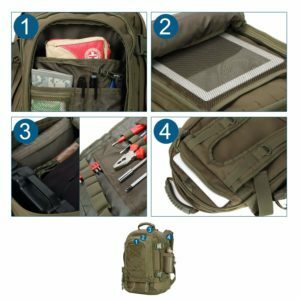 Therefore in my search for a waterproof backpack my goal was to find something that had numerous compartments, was durable, and under $100. What I ended up with was the WolfWarriorX Military backpack. This pack worked out perfect for my trip; due to all the space and compartments, I was able to separate my stuff in an organized manner yet still carry everything I needed for the day trips. It held up well in light rain yet I did notice the zipper seams got damp when I went under Seljalandsfoss. Overall I’m happy with it and will use it on further adventures. Years and years ago, before I got into backpacking, I’d see people wearing the puffer jackets and think to myself how ridiculous those jackets looked. Well I put my foot in my mouth because when it comes to backpacking or traveling light these goose down puffer jackets are amazing and after trying them out I could never go back to a heavyweight jacket. The goose down jackets allow you to remain extremely warm with minimal weight added. At first it may feel as though a garment this light would never keep you warm but trust me, put it on and walk around the store a few minutes, you’ll see the power of these style of jackets. The other perk is they usually can pack down into a small pouch which saves a ton of space, weight, and can be doubled as a pillow for your plane ride over. Make sure it is filled with real goose down feathers and not some synthetic material, the feathers are the magic behind the warmth. Get one that has been treated to resist and rebound from water. Untreated goose down that gets wet pretty much renders the jacket useless as the feathers wad up together, significantly reducing effectiveness. Go with the quality known brands (Marmot, Mountain Hardwear, Outdoor Research) and avoid both the cheap knock offs, or the designer brand (Michael Kors, Calvin Klein, etc.) that add a huge price tag without adding extra benefits. I have three goose down puffer jackets (Marmot & Mountain Hardwear) that I alternate between depending on how cold the region of the world I’m traveling to is. For this trip I wore my Mountain Hardwear Packdown Jacket with 650-fill. I chose this one for this trip since it has Q.Shield technology meaning the feathers have been treated with permanent water repellency, something much needed for Iceland. For women looking for a great down jacket look at the Marmot Women’s Quasar Nova Jacket, my wife was very warm therefore very happy with it. Again these puffers aren’t meant to be worn alone in the rain so if it does start pouring be sure to throw your waterproof jacket over them. This isn’t a necessity especially if you’re traveling on a budget, your phone quality is good enough for you, or if you don’t need photos to document what a good time you have since you’re the one living it and know how awesome it is! For those who may be wanting to take back some higher quality photos to show off the land of fire and ice to your friends then looking into a reasonably priced camera may be of interest. I myself am by no means a skilled photographer therefore my goal was to get a camera that had a bit more than the standard digital zoom pocket camera yet didn’t have so many bells and whistles that I didn’t know how to use anyway. 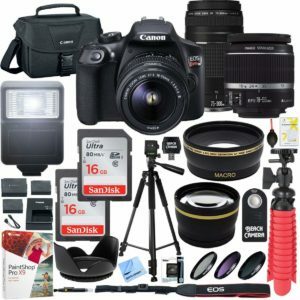 After much research I ended up with the Canon Rebel T6 EOS package. Now there are a TON of package combinations for this camera and it is actually a very versatile camera accommodating the newbies as well as the moderately more skilled photographers. The quality of the images is really great and the basic photo editing software that came with it allowed for some quick and easy edits post trip. The photo below (and throughout this blog topic) are shots taken with the camera. Since you’ll likely be on your feet a lot, whether it be trekking around Reykjavik or hiking to various mountain falls, you’ll want waterproof hiking boots that are comfortable for long periods of time. Since much of the landscape out of the city is rocky I suggest going with ankle high hiking boots to give you added support so you don’t roll your ankle resulting in down time and missing out on the beauty Iceland has to offer. For this trip I brought my Columbia Men’s North Plains Waterproof Mid Hiking Boot that I also wore to hike Mt. Katahdin in Maine. I gave them a coat of water-proofer just for added measures. My wife wore her Merrill Siren Mid Waterproof hiking boots and had no issues what so ever. These worked for us since there wasn’t any snow while we were there and they even kept us warm during our glacier hike. The majority of places I went all accepted credit or debit cards so luckily for me it wasn’t an issue however I have heard that if you’ll be visiting some of the smaller towns in the countryside that some may only accept cash. Just to be safe I had some USD converted to the ISK (Icelandic Krona) and brought some cash along for the trip. I’m always a believer in bringing cash on a trip even if it’s within my own country, you never know when you may need it. Converting currency is pretty easy but I’d say don’t wait last minute to do it if you do plan on brining some ISK along. Most local banks will be able to convert the money for you for a fee applied by both them and the third party exchange vendor they use. The process usually involves determining how much USD you want to spend then they’ll let you know what that’ll get you in foreign currency after fees are applied. Once you agree on a total exchange cost it takes a couple days and depending on the vendor it either gets sent to the bank for pickup or to your house. If your local bank does not have this service you can work directly with Travelex to exchange currency. Let’s hope you won’t need to use this at all and your trip goes off without any issues whatsoever, however if an unfortunate event occurs requiring you to need to use local medical services it helps to know if you’re covered or not. If you have insurance call the customer service number on the back of your card to check your coverage status in Iceland. Should you need to use non-emergent care over there it helps to know what locations are covered (if any) to try to reduce your out of pocket expenses. If you don’t have insurance or your current insurance doesn’t cover foreign medical care you could look into getting short term medical coverage for traveling. There are numerous companies out there that provide this, a few of which are the well known carriers like Cigna & UnitedHealth. We get so used to being able to send a text or look up directions to a restaurant whenever we want so it might not even be something that crosses your mind until it’s too late and you are hit with hundreds or thousands of dollars in roaming fees. Look into your current cell phone plan to find out what coverage you have overseas. Some companies like Verizon will let you add on a monthly international plan, though I felt it was a little too pricey ($75 when at the time of me looking into it) for a 6 day stay abroad. The other option is to buy an unlocked phone with an international SIM card. Though I don’t have experience with this I see sites like Mobal offer various phones & plans at more reasonable rates. If you don’t want to buy either you could turn your phone to airplane mode (and be sure it stays in airplane mode) and only use your WIFI throughout the trip. This method doesn’t cost you anything additional but does limit your access to utilizing your phone and puts you at the mercy of your hotel, transportation, and restaurants offering free WIFI. Using this method we had to map our directions to a location at our hotel on WIFI, screenshot it then try to navigate there hoping we didn’t miss a turn. Two of the three guided tours we were on had WIFI on the bus and most rental cars provide an option to add WIFI as well. For those interested in all the nitty gritty detail of the 6 day Iceland all inclusive package I booked and my review of the whole trip read my post “The Best 6 Day Iceland Vacation“. *LivableLandscape.com is a participant in the Amazon Services LLC Associates Program, an affiliate advertising program designed to provide a means for sites to earn advertising fees by advertising and linking to amazon.com. All recommendations are honest and based on actual experience with items.